I collect Victorian jewelry and have dedicated many hours to studying its styles and materials. After the death of Prince Albert, Queen Victoria entered into a lifelong period of mourning. 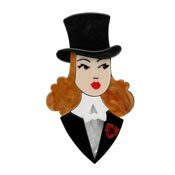 She also set up very strict rules for what could be worn during the mourning period by the royal court and staff. The people followed her example. The jewelry that could be worn during the second stage of mourning was created from one of the "Victorian black" materials One thing that I have found is dealers and sellers of Victorian jewelry are often misidentifying it. Many of my purchases were not what was described. This led to my frustration and desire to find easy and non-destructive ways to identify the materials used in black Victorian jewelry. This article is a work in progress and I will be adding to it during the course of my research. Just what are Victorian Blacks? 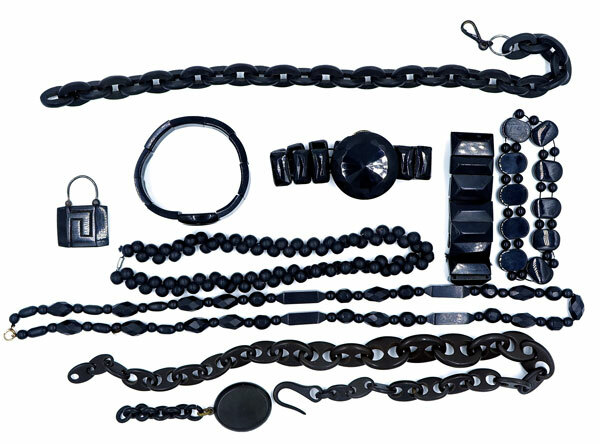 Black Victorian mourning jewelry was created from black fabric, black enamel on metal, Whitby jet, French Jet, black onyx, bog oak, composite, dyed horn, Berlin Ironwork, Vulcanite and very rarely gutta percha. It is pretty easy to differentiate between fabric and enameled metal so we will discuss the other materials in this article. 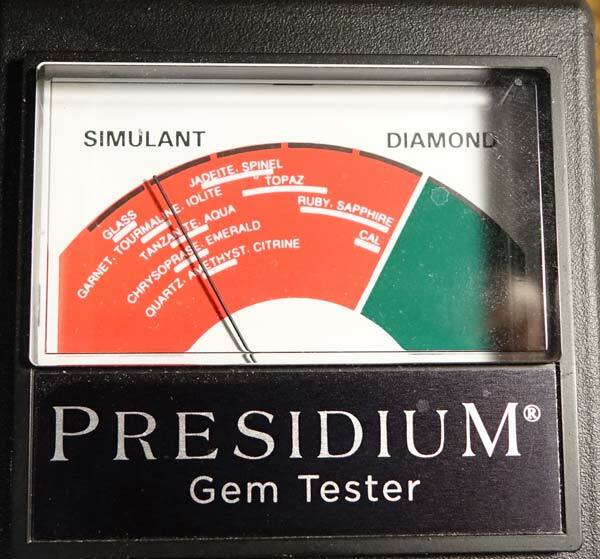 I will be discussing both traditional methods of ID using your senses and the results of my own electronic testing using a Presidium gem tester. Whitby Jet is the most famous of all the Victorian Blacks. Jet is a form of brown coal that is actually the fossilized wood of a tree that lived 180 million years ago. This tree is kin to the modern day Monkey Puzzle tree. The jet was formed when this wood was submerged in water. It would sink, get covered in mud and other materials which applied tremendous pressure to it. After undergoing chemical changes it became coal or the deep black material known as jet. Jet may be found in different areas of the world, but none are as famous and well known as Whitby Jet. Whitby Jet was mined and worked in a seaside town in England called Whitby. Its production was at its height during the reign of Queen Victoria when black mourning jewelry was in great demand. Jet used in Victorian jewelry pieces is usually called Whitby Jet by default. 1. Jet is a beautiful deep black color (jet black) and is extremely lightweight. This is one of the reasons why it was favored for larger, chunkier pieces of jewelry. It almost feels like a type of plastic. Once you hold a piece of Jet in your hands you will understand. 2. If you touch jet to your face it will be warm. 3. Jet was hand carved or done with relatively simple tools. This means individual beads etc. will have uneven sized facets or other indicators of hand carving. 4. Older beads are larger than the later beads due to improvements in the tools used to create them. 5. Jet is a soft stone. Most designs will be thicker or chunkier because thin pieces would not stand up to wear. 6. Jet could take a high polish, but after a hundred years or use it dulls, scratches, and nicks, etc. become more evident. 7. If you rub a piece of Jet on unglazed porcelain it will leave a brown streak. 8. Jet does not smell if you rub it with your fingers (I do not recommend a hot pin to test for the burning coal smell). 9. It is susceptible to chipping at the edges or near holes. These chips will have a concoidal look and will look dull with dull edges since they were never polished. An example of these chips is below. 10. Jet is usually the star of the show and will compose the majority of a design. 11. Findings are usually larger, will be glued on, or the piece will have a hole running through it for assembly. 12. I do not do this test personally, but if you rub jet on wool it builds up static electricity. It will attract little pieces of tissue paper. 13. 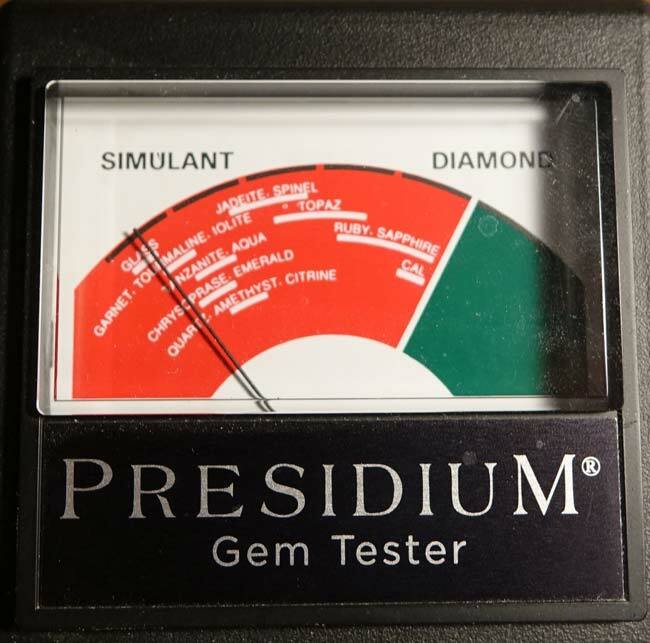 Since Jet is a poor conductor of heat, you can test it with a gem tester! It will have very little or no reaction and will register beneath glass(see below). Black glass was very popular during Victorian times and was known as the poor mans Jet. It was also called French Jet which folks sometimes confuse with Whitby Jet. Black glass came in a shiny, matte, or a textured finish called crepe stone. Crepe stone is not stone at all, it is actually glass. 1. Glass is rather heavy so you will not see it used in larger Victorian designs. 2. Glass will feel cold if you touch it to your face. 3. Glass will not smell if you rub it briskly with your finger. 4. Black glass could be made thinner and smaller and it would still remain somewhat strong so you may see it in inlays or smaller designs. 5. Glass can have visible mold lines. 6. Glass chips can also be concoidal or look like fish scales. The insides of the chips will be shiny and the edges will be sharp (see photo below). 7. 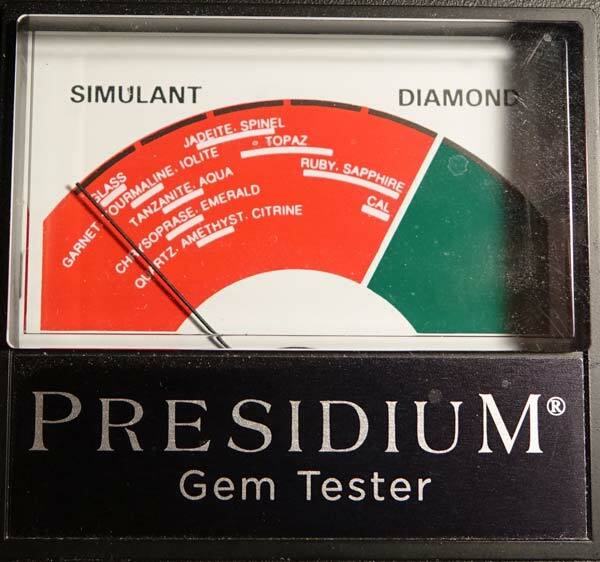 If you test glass/French jet on a gem tester, it will register in the glass range (see photo below). Onyx is a semi-precious black colored stone in the agate or chalcedony group. Chalcedony is a type of quartz. 1. Black onyx is stone so it is heavy unless it is inlaid or in thin slices. 2. It will feel cold if you touch it to your face. 3. Onyx will not smell if you rub it briskly with your finger. 4. Onyx is a hard stone and it polishes to a high shine. Its strength allowed it to be used in thinner inlays. Since it is a hard stone, it does not scratch or dull easily. Onyx was also used in a matte finish so you have to differentiate it from glass. 5. Since Onyx is a type of quartz, it will test as quartz on an electronic gem tester. On my gem tester it is right at the beginning of the quartz band (see photo). Bog oak is wood from an oak tree that was buried in a peat bog for thousands of years. Bog oak has been preserved from the acidity of the peat as well as other minerals and it turns a very deep brown to black color. Other types of wood can also be preserved in peat bogs but they are reddish brown or yellow so we will not be discussing them as a Victorian black. 1. It is lightweight and very deep brown to black in color. 2. Bog oak will feel warm if you touch it to your face. 3. It is a soft material and will be hand carved or sometimes it was pressed into a mold. 4. Many bog oak pieces have an Irish motif with harps, Shamrocks etc. 5. Bog oak will have a matte finish because it does not polish well. 6. Bog oak leaves a brown streak on unglazed porcelain. 7. If you look at bog oak under a loupe, you can see growth rings pretty easily. 8. Like jet, bog oak will usually make up the majority of the jewelry piece. I do not own a piece of bog oak jewelry at this time so I cannot test it on my gem tester but I think it would be safe to assume that it will have no reaction.